Seeing the Alphabet. Please look at this!! I just ran into this on a blog. This is wonderfully creative. I love it. 1 large can chopped tomatoes, more if you want chili to be less chunky. Serve with oyster crackers, crusty Italian bread, shredded cheddar cheese, and extra hot sauce for those who want it really hot. This is not Texas chili, it is probably Cleveland chili, or something like that. But...it works for me, and people always love it. I finally sold my unread 1001 Chili Recipes book along with the painting of Ray Charles at a barn sale a few years ago. It is raining cats, dogs, and hammerhandles here in Boston because Jeanne is finally saying her goodbye to the East Coast. The trees are shaking, the leaves are blowing and the streets are rivers. Luckily, this storm is going through here now, rather than after the leaves have changed colors. If it rains then, all the leaves fall off the trees and turn to yellow mush and our glorious New England tree-viewing time is mostly ruined. News radio this morning reported that a woman in New Jersey was killed by a flash flood carrying her off at a bus stop. That hardly seems possible, yet this storm has meant a lot of lives lost. The pond that I mentioned yesterday is up to its banks, and no one is walking around it today. Even the ducks were taking refuge in the bushes. Now we are left from Florida to New Jersey with the washed away homes and the flooded basements and wrecked cars from falling trees. Hopefully this is the last hurricane for this season and maybe even the next. Enough already. I finished a scarf the last two evenings. It was like knitting with feathers. The yarn is Fun Fur, and it is something I picked up at the hobby store on Sunday. Since I like things luxurious, I bought three skeins instead of the one they recommend, and I made it a little wider and a little longer. It does not shed. It is furry and feathery and luscious, and I have a lot of nerve to wear it. Its saving grace is that it is black and will go with my black coat. If it was red it would be too much, even for me. Even in black, I can't give it away to anyone I know, because they would not like it. Most of my friends are into LL Bean, or something very practical. Ho hum. That is something I think about often. Why do I like the flashy stuff? Oh well, let them wear fleece, I'll wear feathers, thank you. It is all my mother's fault. 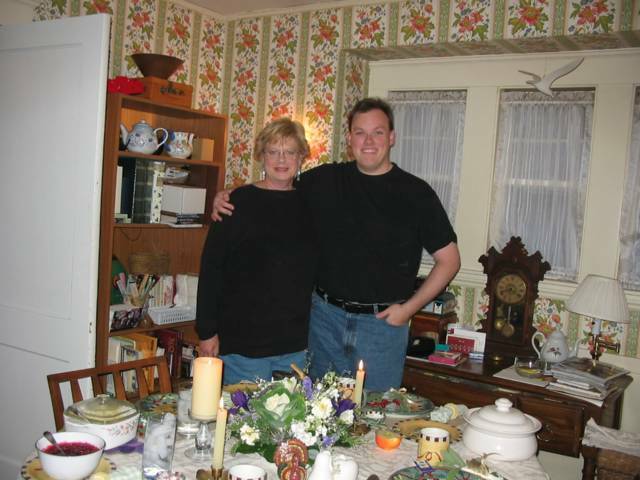 When I was five or six, my mother worked, so I think she sometimes felt guilty. She always has loved to shop and took me to "the city" (Oklahoma City, about 35 miles away) and bought me brand new things to wear to play dress up. I have never heard of anyone's mother doing that for them. We would go to the sale racks at the big fancy department store and buy high heels and purses so that I could use them for pretend and parade around the house in them. Since good taste was not a problem, and color and style mattered only to little me, the price was always right for her, and I always felt really important. I wonder what the sales ladies thought? (Remember when there were actual salesladies?) I remember looking in windows of stores in the big city and being so thrilled that my mom was going to help me buy things there for my very own. So, if I like to shop, it is no wonder. My mom, who is 94, is probably at Wal-Mart (about the only retail store left in Oklahoma) with her walker right now. Thanks again for those lovely brown high heels and the purple purse, mom. What a great mom! Hurricane Jeanne is now visiting in Boston. They forecasted some rain for mid morning today, and more rain for later this evening. On my way to work at 8:00 it was already pouring down and the streets are starting to flood. Folks on their morning dog walk or jog were caught without umbrellas and running helter skelter through the park. The hard rain now seems to be over. There is not a breath of wind, so I guess this Hurricane blew itself out over Georgia. I feel sorry for the people who can't get to their homes yet. Hopefully they can all get back to normal soon. It is probably a good thing for them that President Bush's brother is Governor of Florida. Boston can use the rain, so it feels like a good thing for us. A book study group is starting at church as part of World Hunger. We have taken the "Care" committee and combined it with this program, so I would like to call it "Care About World Hunger". The book we will start off with is Paul Theroux's Dark Star Safari which I read on vacation this summer. He travels the length of Africa from Cairo to Cape Town, going into areas that are off limits to tourists amid warnings of grave danger. He travels anyway he can, by train, dugout canoe and cattle truck. He eats what he can find to eat and visits some very nasty places. It is a tough subject, but the book is very interesting and "fun" to read. What he finds there is devastation and ruin of an economy and a culture. It is not pretty. He happens to feel that too many aid organizations have ruined people who otherwise might want to work harder. I'm not sure about that yet, but will read more on the subject. Just getting interested in this, and reading about it, makes me feel that there might be something people can actually do to help. The first part of knowing what the solution is, is to understand the problem. Our church World Hunger group meets this week to find out how we can schedule our World Hunger appeal into our calendars and keep the subject on the radar screen of our busy everyday lives. Who knows? Maybe we can help. More later. Fare well for today my friends. I had a great deal of trouble falling asleep last night. Seemed that the quiet night, and the full moon, did not help at all to quell my sleepless thoughts. I was wondering about the folks in Florida, and how upsetting it must be to have no place to run, no place to hide. The whole state was covered with Hurricane Frances, and it seemed evacuation wasn't even possible this time. Add to that my thoughts about Haiti and the horrible situation that is there with many people dying from lack of food, water, medicine and disease caused by bad water. I cannot imagine what has happened to that country. Not that staying awake will help anything, but I did a lot of praying for those poor people. Sunday morning I played in the bell choir for the first time, and it was very exciting. Even that experience kept me awake last night. It is not as easy as I thought it would be. I read music, and I thought that would help, but it seems the only way not to get lost is to count out the beats of the measure. The fact that your bell is the only sound, means that you can't hide behind the other sopranos like you can in a choir. With bells, you're all playing solo, so to speak. I managed to play the D(7) and F(7), and those are the BIG bells, in the back row. It was really fun! I didn't flub up, I didn't make a horrible face as I flubbed up, which I thought might be a problem, and I think I pulled the whole thing off miraculously. I can hardly wait for bell practice on Wednesday night. I'm supposed to be signed up to be the substitute ringer, but I can tell right now that I am going to be there every week like clockwork. That means another rehearsal night at church, since I already sing in the choir. Our collection for the food pantry was a huge success. I fixed up 50 bags labeled with food items like powdered milk, canned meat, pasta and macaroni and cheese. All the bags were taken and I can't wait to see all the food that we have collected next Sunday. Everyone seemed happy with the idea, and happy to do what they can for our local food pantry. It's a start on helping with World Hunger and I am very excited and happy about the results to come. Good luck Florida. I hope the food and water goes through soon in Haiti, ending that misery, and I will keep ringing those bells of hope. I'm beginning to feel like K-Mart. I am getting excited about Thanksgiving and Christmas already. I know Halloween hasn't gotten here yet, but I think I'll just skip it this year. Frankly, I don't remember all this excitement about Halloween when I was a kid. Now Halloween is as big as Christmas as far as decorations are concerned. People cover their front lawns with inflatable decorations as big as the Macy's parade, and festoon their houses with all manner of colored lights and fake cobwebs. When I was still trick or treating, I think the only decoration we had was what we planned to wear that night as we went from house to house around the block. Usually I was wearing something totally rediculous, like my ballerina outfit. My mom tried to talk me out of it. I almost froze in my skimpy pink tutu and tights. I never tried to be scary, I always just wanted to be pretty. Let's face it, I just didn't get it. We never decorated our house, or wore costumes to answer the door. I think we even used plain brown grocery bags to collect the candy in. Even our bags of candy were a source of displeasure since my mother never wanted us to eat it anyway. So, where's the fun? There is another bigger reason Halloween was never my favorite holiday. To begin with, I'm a scardy cat, and the whole concept made me want to run to my mother's skirts. Who wants to answer your front door to a bunch of strangers in masks who threaten to trick you if they don't like what you give them? Not me! So...now that I am an adult, I can just go ahead and admit that Halloween scared me silly and I still see nothing pretty or appealing about a mean looking black cat or cobwebs or a pointy witch's hat and broom. I'll even admit I hated The Wizard of Oz. The flying monkeys terrified me and still do. I consider it my first attempt to watch a horror movie. The fact that I grew up in the middle of Oklahoma where blowing away in a tornado was a very real possibility didn't help either. Most of the time I was sitting with my eyes covered by my hands. They shouldn't make children watch such stuff. So this year, I'll skip Halloween thank you, and move right on to Thanksgiving and Christmas, where nothing is scary and everything is just....pretty. Fall is coming fast. The Wool Tour is October 9 and 10th. The Wool Tour is a trip through New Hampshire to visit five farms that all have something to do with the fine art of working with wooly stuff. I have been going on the Wool Tour for seven years at least. I heard about it when I owned a farm in Londonderry, New Hampshire, and had many friends nearby who were avid knitters like I am. This tour is pure New Hampshire. It is a chance to take a drive through the lovely back woods, and map in hand, find these five farms and visit with folks who love all things wool. There are sheep farms to visit, where they have sheep dog demonstrations, and where you can buy all kinds of roving for spinning, wool for knitting, some hand-knitted garments, and even lamb to eat (eep). One farm sells a field full of pumpkins as well as wool. Different "wool people" gather in their barns to talk about their favorite projects and sell all matter of stuff. One farm has master weavers who show their new works, their hand dyed yarn for weaving, natural dyes and looms. The Alpaca farms have their own fleece to sell, as well as a friendly Alpaca or two if you brought a truck. Everyone enjoys talking to other knitters and spinners, people who enjoy making things with their own hands, all the while knowing that the time they spend on each item could never be sold for what it is worth. The Fiber Studio has a huge inventory of yarns, wheels, looms, knitting accessories galore and a huge studio for classes. There isn't much that the owner, who has a masters degree in fiber arts, doesn't know about spinning, weaving or knitting. At the tiny Wool Room yarn store in Antrim, they have demonstations of spinning on antique spinning wheels. I look forward to seeing the woman again who sits on her chair with her angora bunny on her lap and spins the yarn right off the bunny! I look forward to visiting their two Cotswold sheep and buying some roving to spin into a Christmas scarf or two. I have made a lot of friends at these farms and yarn shops. The Wool Tour is a little slice of heaven for anyone interested in fiber. Add to this the glorious colors of New Hampshire in fall, and it makes for a day I look forward to every year. The first time we went to Lafayette, Louisiana to look for Cajun music, we went to to the Acadian Village. They had a Cajun band and dancing that afternoon and it was really fun. The dancers were good, and we tapped our feet to the music and wished we knew how to do what they were doing. Acadian Village has homes like Cajuns would have lived in 100 years ago, when they were mostly rice farmers. After being pushed out of Nova Scotia by the English in the late 1700's, the Cajuns resettled a part of Louisiana that made for a very hard life. Their music documents their sadness and their struggles, as well as their joie de vivre. As we left one of these small houses, a man in overalls sitting idly on the porch, told us about Lake Martin. Lake Martin is not a big tourist site, and seems almost to be a secret. It isn't even on the maps. It is in the middle of country fields and dirt roads about 10 miles out of town halfway to Breaux Bridge. We finally found it. Few people are there. It is a big blue lake with true Louisiana swamp all around it, cyprus trees dripping with tentacles of silver moss. The water on the edges under the trees is green with scum and we watched nutrias, which are like little muskrats. I took this picture of a great blue heron there. George thought it was amazing that I had even seen this bird, since he is so well camoflaged. 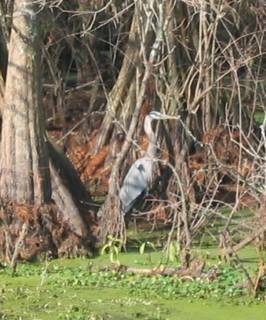 We saw several herons, and spent a long time staring at the swamp through our binoculars to see signs of life. The first time we were there it was May and the trees were full of spoonbills, who build their nests there. We heard later that this lake is the largest nesting area for spoonbills in the country. I wouldn't doubt it. The trees were thick with them, like clumps of cotton candy. They are flamingo pink and white, and very large. They were hovering around their nests and we could see the little white heads of the babies popping up. The colony settled in those trees was amazing and we spend hours just driving around the lake and watching them. We never miss going back to Lake Martin now. Every time we visit that part of the country we make several trips there, taking a picnic and enjoying the solitude and the creatures that live there. Last December, we saw a 12 foot aligator lazily sunning not far from the road. He was not green. He was gray, like clay mud. He didn't have a care whether we were there or not, didn't even notice us, and we weren't that far away. I think he knew that he belonged there and we did not. Lake Martin is one of my favorite places. And we know about it only because a stranger in overalls sized us up as people who would love Lake Martin as much as he does.... and we do. World Hunger is a big issue. But in my little corner of the world, we are making an effort, small though it may seem. I am excited about being the ELCA Synod World Hunger representative to my church, the Lutheran Church of the Redeemer. Today I called a local private grocery store and they are going to donate shopping bags, which each of us can fill and return to our local food pantry. I will label the bags with the items like powdered milk, canned corn, macaroni and cheese, hot cereal--which the food pantry told me they needed most. There are about 20 items they need right away, and we have 120 active people in our church. If the bags are there every Sunday and brought back full, perhaps we will be able to fill those empty shelves before Thanksgiving! I am excited. Maybe it doesn't take much to excite me, but the idea of a community coming together to fill a specific need makes me really happy. The man at the grocery store could not have been nicer to me. I will go tonight to pick up the bags. It feels like the right thing to do and a I hope that a good start to working on World Hunger is to work on Neighborhood Hunger. Blessed be! This morning, to get away from the news of 500 dead in Haiti--thousands standing on rooftops after flooding from hurricane Jeanne, and the news of 8,000 homeless people unsheltered in New York City, and more drivel about CBS and Rathergate--I played a Cajun music CD on my way to work. I have bought several Cajun music CDs in all kinds of places, music stores, gift shops in New Orleans, and from the Savoy Music Center in Eunice, LA, owned by Mark Savoy, one of the leaders of this generation of Cajun musicians. His wife Ann Savoy, a naturalized Cajun who sings and plays guitar, fiddle and accordion, is also a serious chronicler and collector of Cajun songs and music. (See pictures of that Saturday morning below). I have made a study of Cajun music for the past few years, and felt I was really getting to the core of it when I visited their music store that day. It is not easy to get to Eunice, LA. if you live in Boston. Cajun music makes me want to dance, simple as that. It makes my heart sing. Dancing to Cajun music isn't easy. Recently, we went to hear Steve Riley and the Mamou Playboys play at a club near where I work. The dance floor is tiny, but the music just carries people out to the floor. That same week we also went to see Ann Savoy and her band The Magnolia Sisters. Toward the end of the evening, a man asked me to dance. He had that look in his eye that he wasn't really sure if he should ask me or not. Cajun dancing isn't something to be taken lightly. He patiently showed me how he was going to use his arms to steer me back, and how to twirl fast under his arm and step back quickly to the next beat and off we went. I did it! I knew how! We flew around the tiny dance floor. It was wonderful. In Breaux Bridge, Louisiana, at Mulates Restaurant you can hear real Cajun music and watch as the real Cajuns dance. There are lots of places to go in that part of the world, around Lafayette. It is a regular saturday night thing for them and I am jealous! The man steers the woman around the floor, and all the dancers are in a circle, so no one crashes into each other. The Cajun dancer does not move from the waist up, they glide as they dance using repetitive steps, either the two step or a waltz depending on the song. George commented that the men look like they are pushing grocery carts. The good Cajun dancers heads do not bob up and down like other dancers, they could balance a flower pot on their head I'm sure. The women always dance with their partner going backwards. Around and around they go, and although the beat of the music is very fast...the motion of the dance done well is very smooth. It is very hard to dance to Cajun music, and it is one of my big goals to learn. Dancing with someone who does't know how to do this is a catastrophy, since the beat is so fast and unrelenting. Here at Johnny D's, the crowd listening to the Mamou Playboys didn't really get the hang of Cajun dancing, and were just hopping around and up and down, and thoroughly enjoying themselves. Some people think Cajun and Zydeco are the same, but they are not. But I wouldn't give up a chance to hear either one. I wish I had been born on the Bayou Teche so I could go out every Saturday night and dance to real Cajun music too. Listening to Jo-el Sonnier, the Savoy-Doucet Cajun band, DL Menard or the Balfour Brothers, does wonders to make me forget about the bad news of the day. Drea de Matteo from "The Sopranos" collected an Emmy for Best Supporting Actress last night for her final season as Adriana, who was whacked in an unforgettable episode of one of my favorite shows. Ms. de Matteo looked like she wanted to win very very much and didn't want to jinx it by having a speech prepared. From everything I have read about her, I like her. I wish they could get it together and produce new episodes faster. Seems funny that there are three episodes of Law and Order every night, and we have to wait two years for the next 6 episodes of The Sopranos. I happen to love the character of Adriana, and I have read that Drea de Matteo is just a very real, very together person in real life. They say she is nothing like Adriana, but I must admit that what I saw of her last night...she looked just like how Adriana looked with the piled up hair, and lots of makeup. Adriana was a survivor, but...alas, she got "whacked". People who play with the mob have short lives. I happen to like shows about gangsters. Maybe because when they get killed you don't mind, since they are all asking for it anyway. It is not like watching someone you care about. Maybe it is because they are all living the dark side of life where money is so plentiful it's a sickness. Casino is my one of my favorite gangster movies, along with Goodfellows and Scarface. I like the clothes worn by Sharon Stone in Casino. Sharon Stone is terrific in this role, and I have seen Casino about eight times at least. Las Vegas is so artificially over the top. I went to Las Vegas three times, mostly on business trips, in the 80's before Disneyland took over. I watched someone, who a friend introduced me to, play $500 a hand blackjack one night. It was exciting. They had two casino suits standing behind him...watching to make sure he made a trip to the window afterwards. I heard he lost $40,000 that night. Probably didn't matter to him. He was the financial vp of a Minneapolis company owned by another high stakes gambler. They were just dipping into the company till. It was all rather glamourous I thought at the time. I perched on my stool in my glitzy black dress and watched and smiled like I belonged there, which I didn't. I still have some beaded bags that I bought there one night after winning pretty big at the slot machines. That night I couldn't lose no matter what I did. They are pretty and I'm glad I have them. It was a crazy night. Money grew on trees. I guess the glamour of the old mob controlled Las Vegas is gone now. When casinos decided to attract families and kids, they changed forever. So now I have cancelled HBO until the Sopranos get it together again sometime in 2006. But I will miss Adriana! Why do we want to write blogs? I think it is because we have things to say that we don't get to say any other way. I read other people's blogs, and am startled to find that some of them are really fun to read, and have become favorites. Regularly, I read a very well written blog about a man's life with his little 18-month-old daughter. Watching her progress, her sleep cycles, her new life unfold...is none of my business...but the blog is written with such wonder and love that I find it marvelous. I read blogs where people publish their poetry. Outside of a poetry class, there are few places to read everyday poems. How many poems actually get published? .0001% of them? Blogging is sharing our music, ideas, political views, and some things that I skip over really quickly. Blogging is sharing our likes and dislikes, our dreams, and all the every day seemingly mundane stuff that makes up like a quilt into a complex and productive life. Writing a blog gives us the space we need to express ideas that don't make it to print, or even conversation. Out in the real world, we don't have time to sit down and talk to each other much. Maybe people are rushing by us to get home to their computers, so they can work on their blog and tell us who they are. I read blogs about knitting, written by women who love to knit as much as I do. I am surprised to find that most of them are better knitters than I am, buy even more expensive yarn, knit more complicated projects and suffer the same dilemna of "so much to knit, so little time". They also have great blogs with lots of pictures of their projects, homes, gardens and children. I thank them for sharing that part of their life with me. Where else but a blog do I get to be like a fly on the wall of other people's thoughts? Yes, it is like writing a diary on the internet. I remember when girl's diaries came with little keys that brothers could break easily I'm sure. Now we just throw away the key, and let the world in. I think bloggers are like prolific poets who have a lot to say and not enough places to say it. Who reads it doesn't really matter. Now that we know that New Orleans has not blown away or drowned, we can start thinking about the Everquest Fanfaire to be held there over Halloween. Woohoo, what a great time to be there. I went to a fanfaire in Boston (right in my front yard) and had a great time. At the time, I was only a lowish level Paladin, but luckily for me, they put your class and your name on your name tag that hangs around your neck, but not your level. In RL, around my friends, co-workers, etc., the fact that I play EQ is known...but not understood. No one in my RL circle of friends could/would ever do it. No one could believe how wonderful our life in Norrath is unless they were there themselves! I met some really wonderful folks at that fanfaire and still send /tells to them in game (hellos). For the most part, Fanfaire takes one whole day, morning till late night, and there are crowds of people, all who have the same passion. I went to one workshop about tradeskills, and everyone there had 200 or over in all tradeskills. I mean, these folks were uber tradeskillers! I went to a GM event, where they took some huge mobs and trained the poor folks in Aviak Village. Afterwards, they made it all better, but for a time, the whole auditorium was cheering and laughing as this unheard of encounter plagued that zone and the hapless players who happened to be there. I hope they got prizes, I'm sure they did. There was a difficult scavenger contest which had people in teams, running all through the hotel complex looking for obscure items and clues. It was HARD! and very fun because it showed the depth of knowledge people have about all the lands of EQ. Incredible! It was great fun to have dinner with 1000+ other Eqers, and see the faces and be free to talk about EQ with joy and energy. Woot what a crowd. If you can get to New Orleans, and you love Everquest, I would move heaven and earth to get there for Fanfaire. I am working every evening on Michael's Christmas Present. I am very excited about working on this granny square afghan, and I'm enjoying each square. It is soothing for me to sit and work on a square, and I was even able to finish one at my weight watchers meeting last night. I have decided not to keep this present a surprise, since I will still be working on it during Thanksgiving, when Michael will be visiting us. I carefully gathered wool instead of the usual acrylic yarn, using some that I had in my stash, and buying some colors to make it beautiful. In choosing colors, I try to follow the rule "the whole is greater than the sum of it's parts". In other words, I want the color combination to have that certain something--a surprising combination of colors that makes it all work together for something charming and, well, magnificent. I had several false starts with colors. I chose dark purple, dark varigated teal, beige, coral and two shades of gray. For some reason, the color of the coral makes me think of Marilyn Monroe's lipstick. Mike loves movies, and I wanted to make an afghan that used "movie" colors. Colors with lots of contrast, yet deep enough to remind me of classics like Akira Kurasowa's "Rashomon," or Orson Welles "Citizen Kane". I make 7 different squares, about 7 of each one, to make it nice and big, and to add drama because you do not see the same repeated. The wool is nicer to work with, much more tender on the hands. I do not believe I have ever seen a granny square afghan done in wool before. It was not the most economical decision, but my hope is that it will be something that he will keep for many many years. The last afghan I made, my mother worked for a week weaving in the ends and sewing each one down with the matching thread color. Talk about dedication! I wish she could help me with this one when that time comes. I haven't figured out yet how to make that happen. 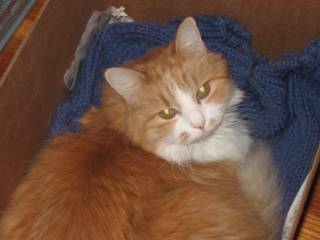 As I crochet, I have often thought of Mike's kitty Taniko as I put together the squares. I'm sure she will love it too. Thank God for dry cleaners. The news about Hurrican Ivan and New Orleans and Biloxi is not good this morning. I am very worried. I love New Orleans and hope to go there a lot more. It is such a diverse and interesting city, and so hospitable to all who come there. The southern charm of the place exudes through it's antique pores. The idea of being 10 feet below sea level doesn't really sink (oops) in, until you realize that you walk UP several flights of stairs to get to see the Mississippi River. The whole place is one low-lying area. There are no hills to flee to. The folks that live in those smallish houses in the close nieghborhoods use public transportation, so they can't drive away. And I heard today there are no shelters. I suppose all the usual places where shelters could be set up would be under water too if the levees failed and the water reached the 12-18 feet they say is possible. Those unique and interesting shops on the French Quarter are very low, very packed with merchandise and antiques and I can't imagine how they can withstand a flood. I am very worried about my favorite city. Biloxi is in the bullseye too. The casinos there are huge, and are situated on floats out over the water. They have not been tested by a hurricane yet, although they are designed to withstand high winds and water. The casinos are a lot bigger and more glamourous than I had imagined and the windows overlooking the water are huge--probably hundreds of feet high. How can they board those up? The chandeliers alone are as big as a house. This hurricane is really incredible with the damage it has done, and I'm very afraid there is a lot more to come. Ok. I am back from my exercise place which is only a few blocks from my house. I found a parking place right in front tonight. There are a bunch of good things about going. First, I no longer am interested in bonbons. I now am interested in drinking lots of cold water. I am sweating. Sweat is good. 30 minutes of hard sweating is my exercise goal. I stretched out some of my sore muscles, and that felt great. The place is air conditioned, there are lots of fans blowing cold air right on my face, and the music is peppy disco with silly words. The whole experience didn't take an hour. Easy. I was thinking as I drove home, it is so much easier to buy something that makes you look slim--than to get slim. It is so much easier to buy some makeup to make your skin shine--than it is to eat the right foods for a good complexion. It is so much easier to think about exercising--than it is to get your body off the chair and start moving! If I had spent half the time exercising in my life that I have spent putting on makeup or dressing in nice clothes---I would be an Olympic champion by now. Oops. No negativity shall creep into my little red head. I did it! Now I will rest on my laurels until tomorrow when I DO IT all over again! I am looking for inspiration to exercise. I usually find that when I get to the place, I really feel good, the music sounds peppy and I'm invigorated. But getting there...ugh. I want to stay home and eat chocolate bonbons I guess. Not. I am leaving now. Whenever I want to become a computer chair potato, I am going to read this, and realize that if I continue to lose weight AND exercise three times a week...I am going to be so much happier and if I sit here and procrastinate. Oy. Why does this have to be so hard???? More when I return! I saw a show last night about poisonous creatures in Australia. One creature is the red backed spider which lays lots of eggs, spawning 100 new spiders each egg cycle. The tiny babies fly like bubbles through the air to their new homes. These black and red spiders are very poisonous and dangerous and live mostly where humans live because of their preference for cement areas and buildings. They showed one lurking in a cement drain pipe. This morning I talked online with my Everquest best friend near Brisbane and mentioned this. Although this TV show made it seem that the bite of one is deadly, Ixsta said that in order to really hurt an adult it would have to be a big spider, or a lot of bites. But he said that they are indeed very dangerous to children. An urgent trip to an emergency room for anti-venom is necessary in any case. They have a little boy, Jordan, who I have never met, but who I like very much and have seen pictures of. Then he said, "I have to go to the basement and see how many are still there, since we are approaching summer here." Sorry to say this, Ix, but that makes me a wee bit nervous. I would not like having poisonous things in my house. I asked him if there was any "poison" that could be put around to deminish these devils...and he said no, they say these cannot be poisoned. I bet they can't! The show also had man eating crocodiles, and Ix said that they are further South. Thank God for that! The jellyfish are perhaps the most awesome of poisonous creatures, and Australia has them in the beautiful coral reefs too. I think that tropical climates have more interesting poisonous things than here in the North East US. But...maybe they are here waiting for me, but I would not know it. I know that Massachusetts has a mean case of poison ivy all along every road side, something to keep in mind if you ever have a flat tire. As a teenager in Oklahoma, my brother, who I adored and looked up to (literally), would go down to the North Canadian River and shoot Cottonmouth snakes, a particularly poisonous, large, and really nasty snake that was pretty common along those red dusty riverbanks. He came home one day and said that he killed one that had just eaten a baby cottontail rabbit (poor wabbit), and saw the rabbit struggling to get free after the snake was already dead. Not sure if that is a "tall tale", but it made an impression on this nine year old that I have not forgotten. The world was "crustier" and more accessible then. Hunting was big sport in Oklahoma in those days. My brother used to take me to the fences and let me shoot cans off of them with his .22. He would hold the barrel of the gun for me sometimes and I would squint and aim. These days we just zoom by the fields and byways in our air conditioned big wheels and ignore all the fascinating stinging and biting critters that lurk in the crevices of the world. So, my EQ friends Ixsta, Angelicca (a true angel if ever there was one), and my little friend Jordan, (hug), if you ever read this, you be careful over there in the Down Under....especially the down under of your own basement. I recently saw a blog dedicated for people who want to send greetings to President Clinton. I was tempted, but needed more time to think what to say. Shall I say, "Get well soon so you can help Kerry with more much needed advice?" Seems to me sometimes that Kerry looks a lot like a wind-up doll, and says pretty much what he is told to say. Polling his advisors to see what the next sentence should be. I'm not very impressed. 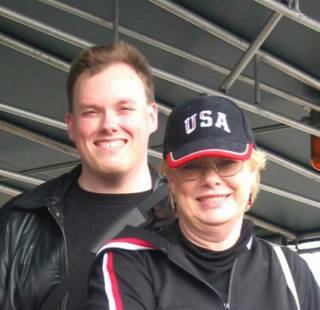 My mother is a life-long Democrat and has donated to the Democratic Party. For her support, they sent her a nice framed picture of then President Clinton. She hung it in a prominent place in her kitchen. When Mr. Clinton "got in trouble with Monica", she was upset with him and turned the picture to face the wall. Clinton in the dog house. But she, like multi thousands of others, and like me, wish him a speedy recovery. Seems to me we all can wish that for each other no matter what our politics. I wonder if he is still facing the wall? Today I am happy! I went to my weight watcher meeting and I lost 5 pounds last week on their new CORE program. This program limits what you can eat, and takes some self control. Allegedly, you don't count points, but eat until your satisfied. For some of us who don't know where that line in the sand is...it is better for me to be careful about the restrictions AND count points. I did it all Labor Day weekend, and I did fine -- with a little planning, help and consideration of friends, and a lot of lugging an ice chest with "legal" foods in it. On Labor Day morning, I had Kashi cereal and skim milk at a picnic table outside of a Dunkin Donuts. That takes committment! No sugar, no refined flour, white rice, etc., and 5 servings of fruits and vegetables a day, limited lean meat, beans and brown rice ok. It is a good healthy diet and I rather like having limits on the kind of foods I can eat. Somehow, having 26 points in a day and using 10 of them up on a slice of pizza doesn't seem healthy. I'm sure my body wants more fuel than a slice of pizza to make it through a busy day. Yogurt and fruit makes me feel good. After limited pizza and other "goodies" for the better part of a year, I don't even crave that stuff anymore. Well, not often anyway. And in the beginning, one cup of spaghetti seemed like a paltry amount, but now I know it is enough. I am not hungry when I eat what I should when I should. Key word: WHEN. I don't want to skip a meal, because then hunger and the "baddies" start happening. I do miss being able to shop at a bakery, but I guess I will get over that after a while too. It is going to be good to be thin and like the Weight Watcher leader said, "Be like a postage stamp and stick to it until you get there." 5 pounds off in one week??? I'm stickin' to it! Maine is beautiful. 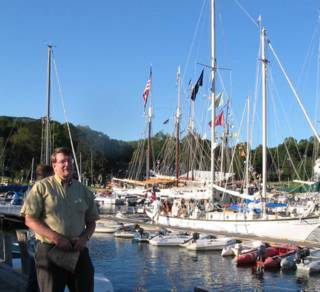 We drove from Boston, with stops in Kittery and at LL Bean in Freeport. Finding crowds and an un-airconditioned store, we followed Route One up to Camden and started looking for our landmarks to find our friends house. It was a lovely weekend, marked by good food, good conversation, and lovely scenery. 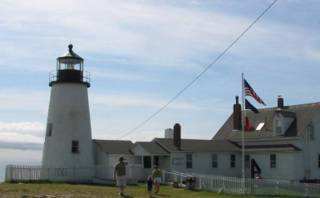 The coast is not as rugged as I thought, but Pemaquid Lighthouse is very nice and the rocks are large and flat and good for exploring. We spent half a day going to Edgecomb Pottery in Edgecomb, ME. As well as inside a huge store, the pottery was displayed on a huge deck in the sunshine and I think I saw every piece. The potters are a man and wife team, who started this business in 1976 and leave their mark on every piece. There were also huge windchimes, 5 feet tall, and heavy, and other works of art in metal. I loved a turquoise teapot, but when I showed it to George, he very astutely decided that the lid didn't quite match and that it was a substitute and that is why this teapot was on the sale rack for $125. Next time I want to buy an expensive teapot, I'm going to check with him! I must have looked at it for an hour and I never even noticed the difference in hue and size. We didn't have lobster until we got back home on Monday evening. But it is not because they didn't have it. Lobster is available at every turn. We wrote down names of motels where we might want to stay on a return trip. The headlines today are "Atkins Diet May be Dangerous, says scientists", and "Atkins Diet bores you thinner". Am I surprised? Eating too much of any good thing is just -- unbalanced. All meat, no bread. All fat, no vegetables. Now, that just doesn't make sense! Boring. What isn't boring if you do too much of it? Boring old carrot sticks. Boring old lemon merinque pie. When we used to have to get our sugar by climbing trees and knocking honey bees down...we only got to do that once a year when the honey comb was full. That kind of seasonality is what makes things interesting. Apples are best in the Fall, so it is fun to wait for them, even though we don't have to anymore. But eating nothing but apples would be plenty boring. Alas, these are the things that never seem to be boring: cakes, cookies, biscotti, and lattes with whipped cream. I can read dessert cookbooks forever and never find them boring. Sometimes they look so alluring you want to eat the pictures. But...to make life interesting, I am not going to eat those things that are bad or dangerous for me. I'm moving on to the excitment of a varied diet of all things good for me: yogurt, fruit, vegetables, lean meat, whole grains and legumes. Sound boring? Not really. Too hard to do to be boring. I always say, when did you ever hear the doctor say that you need to eat more flour and sugar? Thunder, my 12 year old kitty, and ruler of the roost, loves wool and knitting too. Mike and I at Thanksgiving time last year. A hurricane is headed to Florida today and I am concerned about everyone whose home and workplace are threatened. I have lived through several tornados in Oklahoma, but never one that hit my home. It is hard to believe that you hunker down in a hole somewhere, and when you come out, all you have is bricks and boards. In a matter of a few minutes, your whole life changes. I'm sure, with a hurricane, it is all about preparation, boarding up, gathering suppliers, and then....waiting. When and if your home suffers damage, then you come out of the shelter, and have to start all over again. I get upset if I misplace a skein of yarn somewhere. I can't imagine having my whole world around me blown away. When I was in Oklahoma in May, a tornado went by 6 miles from our house, and I was able to watch the TV warnings, run outside to see the black flat cloud that was feeding the funnel, and then into the livingroom to tell mother the latest news. Actually a trip to the fruit cellar seemed like fun then. Coming out of the fruit cellar afterwards is the scary part. In Oklahoma, they are so used to tornados that the tracking is specific. They tell you what streets! the tornado is going past now. People have cellars or know someone who does. This tornado was a level one, rather puny, and strayed into the farm fields and only did damage to a few houses and a roof of a high school. Rather anticlimactic actually. A fizzle, thank you Lord. This current hurricane has the same name as my mother, Frances. She will make note of that I'm sure. We don't get to name tornados in Oklahoma, only date them. In 1976, a tornado measuring a huge one mile across hit Union City, Oklahoma, 20 miles from where my mother lives. It just mowed down the whole town, the schools, the brick Catholic church, the houses, everything. Nothing left except dirt. Sometimes tornadoes even take the topsoil with them. When I went back to my high school reunion years later, I met a classmate who is now the principle of the Union City Highschool. They rebuilt. I will pray for the carpenters who will help rebuild Florida and I will pray that with all these early warnings that everyone in Florida gets out of harms way. Those of us knitters who can get excited about a tea cozy need to stick together. I have a new book, called Mindful Knitting http://www.tarahandknitting.com/MindfulKnitting/PublishersWeeklyReview.htmand it is about meditation, and simple but nicely designed projects to do while you are practicing "mindful" knitting. I suppose this is the opposite of watching Pulp Fiction, or Kill Bill, while knitting. I don't know that it matters much to me, but I will try. I can knit in a traffic jam, at a stop light, at the beach, in a car, in a meeting, and especially at home camped in my favorite chair with a good light. But, I like the idea of being mindful about all kinds of things. Mindful cooking. Thinking about what you are doing and not mistaking baking soda for baking powder, makes for a much better cake. Mindful kitty litter box cleaning. Watching what you are doing, don't spill, all the while trying not to breathe. The author said that she studied under a Tibetan monk with a very long name, and even the Dalai Lama. I suppose that everyone in those crowds that listen to the Dalai Lama can say they have studied with him--and if I had ever seen him, I would too. Why not? But I have enjoyed reading the book and I will make her cute knitted tea cozy and try to listen to my breathing instead of to the Rolling Stones. Yesterday I started a shawl with two strands of yarn that I chose along with a new pattern. One yarn is nubby and the other is silky wool and something that makes it soft and shiny. (I need to be more specific I know. Sometimes I'm bad with the details.) I knew I was in trouble from the start. The pattern is a triangle in a lace pattern and called for casting on of 164 stitches. Triangle shawls should start with the point, so that you can quit when you decide the shawl is big enough or so you have a project that is finished when you run out of yarn. I was thinking while I was casting and counting that this is enough for an afghan, and that I had now idea what the guage of these two yarns together was, and therefore, no idea of how big the shawl hem would be. Turns out that was not the worst of my problems. The pattern was a lace made with *yo, k2tog(SSK)-psso, a common stitch, but one that should be used in combo with other stitches...not alone. I have knit variations of this stitch for years, but this one, because it was repeated over and over across the whole piece -- became moanfully repetitive, and worse....it hurt my hands! I didn't give up for 3 hours. I kept going. And my idea of a beautiful shawl looked like a long fuzzy green snake the color of pond scum. And my hands hurt. Good knitters make good rippers, or vice versa. I pulled it off the needle and wound 3 hours of work back into a ball of yarn. Cut my loses, I said to myself. That shawl is going to Maine this weekend...or bust. I will not finish it now, but I will at least be able to take the yarn and a new pattern along. Designing is hit and miss sometimes. I have learned not to be disappointed, that some projects just fly through your fingers and turn out lovely, and others fly and are mediocre, and others just land with a thud.